Apparently unable to respond to my previous blog, addressing his arguments regarding burial space at the AR camps and the Paris Cimetière des Saints-Innocents, Friedrich Jansson swiftly changed the subject from burial to cremation. In the later stages of the decomposition process, butyric fermentation and dry decay , a corpse is left without most, and finally without all, of the water that makes up most of the human organism. One would expect this to positively influence external fuel requirements in two respects, one being the much lower mass to be burned and the other that little or no heat is expended in evaporating body water. This assumption is supported by evidence whereby at Treblinka extermination camp corpses removed from the graves required less fuel for burning than fresh corpses. Assuming that the human body consists on average of 64% water, 14% fat and 15.3% proteins,405 a corpse of 60 kg contains 34.80 kg of water, 8.40 kg of fat, and 9.18 kg of proteins. 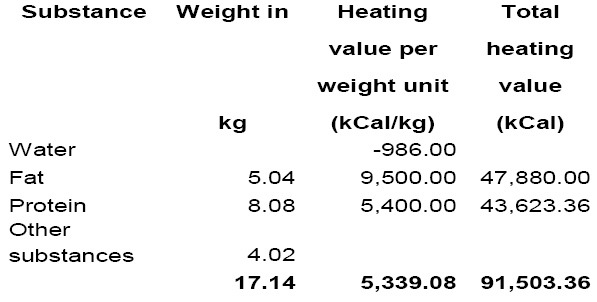 The heat consumption for the evaporation of body water and the superheating of the steam to 800°C thus amounts to [640+(0.493×700)] ≈ 986 kcal for 1 kg of water. 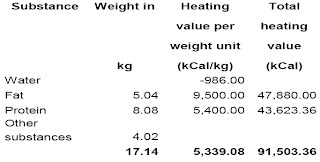 Animal fat has a heating value of some 9,500 kcal/kg, hence, in the thermal balance the heat added by 1 kg of fat is equal to the heat lost by the vaporization of (9,500÷986=) 9.6 kg of water. For the proteins with a heat value of about 5,400 kcal/kg this ratio is roughly 1:5.5 in terms of weight. Therefore, even assuming an extreme case where the alleged corpses at Sobibór would have lost their total water content over a period of 4 months, the heat of vaporization thus saved would have been 38.4×[640+(0.493×700)] ≈ 37,800 kcal for each corpse. To balance this saving in heat, a loss of, say, 40% of body fat and 12% of proteins would have been sufficient: [(0.4×8.4×9,500) + (0.12×9.18×5,400)] ≈ circa 37,800 kcal. The above looks quite "scientific" and is probably correct – under the assumption that the corpse’s weight remains unchanged and the corpse’s calorific value, expressed in kcal/kg, thus remains the same. Of course this is not so. 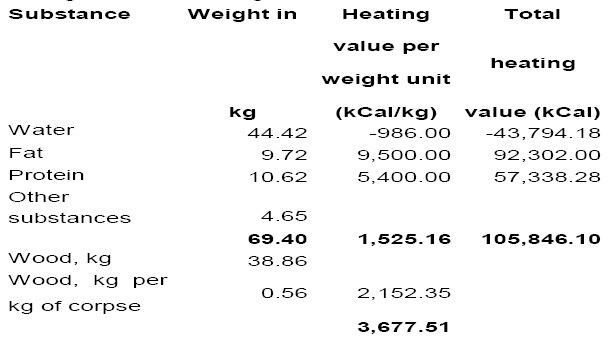 As shown in Table 3.5 below, MGK's 60 kg corpse has a total heating value of 91,509.60 kCal and a heating value per weight unit of 1,525.16 kCal/kg, assuming MGK's distribution by water, fat and protein, the heating values per weight unit they give for each of these substances and that the 4.02 kg of body weight that are neither water nor fat nor protein are neither an asset (like fat and protein) nor a liability (like water) in the heat balance. Now the body loses all its water, 40 % of its fat and 12 % of its proteins as per MGK's example. As MGK seem to assume that all three substances vanish completely, this of course also means that the corpse's weight is reduced accordingly. We thus get what is shown in Table 3.6. With zero water, 60 % of its original fat and 88 % of its original proteins, the body now weighs just 17.14 kg and has a total heating value of 91,503.36 kCal and a heating value per weight unit of 5,339.08 kCal/kg - very close to that of protein (and not far below that of coking coal) and 3.5 times higher than the heating value per unit of the fresh, un-dehydrated body. Are MGK trying to tell their readers that burning a corpse with a heating value of 5,339.08 kCal/kg requires the same amount of wood per kg as does burning a corpse with a heating value of just 1,525.16 kCal/kg? […] The correctness of the above reasoning is confirmed by the fact that only very low amounts of additional fuel are required to burn carcasses reduced to only their bones. […] A more pertinent argument of the "Revisionist" authors is derived from the so-called Minnesota Starvation Experiment (November 1944 through December 1945), in which 36 volunteers underwent a restricted diet over 24 weeks and saw their weight dropping from an initial average 69.4 kg in the last week of the control period to 52.6 kg at the end of 24 weeks of semi-starvation, a loss of 16.8 kg. Water eventually represented 37 % of the lost body mass (6.2 kg), protein 9 % (1.5 kg) and fat 54 % (9.1 kg). MGK argue that "the loss of 6.2 kg of body water saves some 6.2×(640+0.493×700) ≈ 6,100 kcal in terms of fuel requirements, as opposed to a loss of available fuel of (9.1×9,500+1.5×5,400) ≈ 94,500 kcal caused by the loss of body fat and proteins. This results in a negative balance of some 88,400 kcal, the equivalent of 23 kg of dry wood." MGK are right, of course in that burning the fresh corpse of a person that has lost most of its fat but a lesser part of its water due to malnutrition will require more wood and/or other external fuel than burning the fresh corpse of a person with a normal fat and water content, even though the mass and weight to be burned has been reduced. Quantifying how much more wood is required, however, must take into account the weight loss and the impact thereof on the calorific value in kCal/kg. Table 3.7 shows the original weight of the Minnesota Starvation Experiment (MSE) test subjects, broken down into water, fat, protein and other substances according to the ratio applied earlier by MGK (64 % water, 14 % fat and 15.3 % proteins, other substances the balance between the sum of these three substances’ weight and the test persons’ original weight of 69.4 kg). It is assumed that burning such a corpse on a grid with the method applied by Dr. Lothes & Dr. Profé, and arguably on a much larger scale at the Aktion Reinhard(t) camps, would take 0.56 kg of wood per kg of corpse weight, or 38.86 kg of wood in total. In the above-quoted statement MGK consider 23 kg of wood to correspond to 88,400 kcal, which means that they are assuming wood with a calorific value of 3,843.48 kCal/kg. 0.56 hereof is 2,152.35, which raises the corpse’s calorific value per weight unit from 1,525.16 to 3,677.51 kCal/kg. This is assumed to be the calorific value per weight unit at which the normal-weight corpse combusts. These amounts of additional fuel, according to Jansson, correspond to an added heat of 15,202.77 kCal/kg. This, in turn, is supposed to prove my assumptions must be wrong. e) The Mokshda Green Cremation System, an innovative device introduced in India for human funeral pyres with the express objective of considerably reducing fuel consumption. The description suggests that it’s a rather simple device, and an open-air pyre rather than a cremation oven. It should also be noted that its inventor, Vinod Kumar Agarwal, thinks it should be possible to burn a human body with no more than 22 kg of wood (ratio assuming a body weight of 70 kg as Mattogno does: 0.31 to 1), and that he managed with 100 kg per body (ratio: 1.43 to 1) using the "raised human size brazier" he unsuccessfully (obviously not because of its efficiency but because it failed to gain acceptance among tradition-minded Hindus) tried to introduce in 1993. An essential feature of this brazier was its elevation, which "allowed air to circulate and feed the fire". 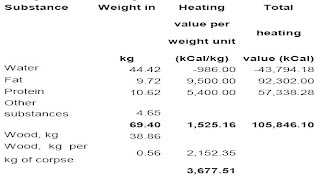 These examples show that it is possible to cremate pig carcasses, other carcasses or human corpses with much less fuel expenditure, in terms of the ratio between wood or wood equivalent weight and carcass/corpse weight, than in the case mentioned by Jansson. The ratio may be 2:1, less than 2:1 or even as low as 1:1 according to these examples, versus 4:1 in Jansson’s example. And then there are the aforementioned experiments of Dr. Lothes & Dr. Profé, who achieved a ratio of just 0.56 kg of wood or wood equivalent per kg of carcass, and that in their less fuel-efficient experiments. Lothes & Profé burned beef cattle or horses, which contain less fat than pigs, so it stands to reason that with their method (burning on a grate above a pit, which differs from the methods applied in Jansson’s example as well as all but the last of the more recent examples I mentioned above) they could have burned pigs with even less fuel expenditure than they needed for beef cattle or horses. Jansson asks whether I indeed believe that, as is shown by my "analysis" (or better, by what this "analysis" implies according to Jansson), "100 kg Poland China pigs will self-cremate". Well, I certainly do not believe that they would ignite as easily as suggested by Jansson’s deplorable "hold up a match" - straw-man. I also don’t believe that bones ignite when you hold a match to them, even though they have a calorific value of 11,000 BTU per pound (6,107 kcal/kg) according to Norbert Fuhrmann, Sales manager of Air Burners LLC in Florida, USA, cited in the blog Belzec Mass Graves and Archaeology: My Response to Carlo Mattogno (4,2). The same goes for wood and coal. However, I do believe that these substances, once ignited, can sustain their own combustion, which in turn means that no more additional fuel is required to combust them than is required to make a fire in which they ignite (as concerns bones, see the calculations in the aforementioned blog, which are based on data in a technical report headed Elimination of the carcasses of animals that have died from anthrax). So the answer to Jansson’s question is that a) a kindling fire strong enough to split open the skin and cause the fat to be released is required for a pig carcass to sustain its own combustion with the burning of its fat, as is a surface that absorbs the fat emanating from the carcass and acts like a wick; and b) the kindling fire does not necessarily require a large amount of external fuel. 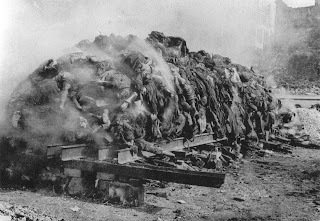 Note that in the experiment described by DeHaan and Nurbakhsh, unlike in the experiments performed by Dr. Lothes and Dr. Profé, the carcass was not placed on a grate above the external source of fire. Air circulation therefore was probably not the best, unlike in Lothes & Profé’s experiments. Some related information was found in an article concerning a Nazi extermination camp and its trouble destroying the corpses (3). Burning gasoline on piles of corpses on the ground did not consume the corpses. Eventually an "expert" was brought in who arranged the bodies on a rack with the corpses that appeared to contain some fat being placed on the bottom of the pile. A good fire beneath the rack caused fat to drip down and burn. The corpses which were thus over the fire instead of on the ground were reduced to ashes. Ettling obviously considered that replicating on a much larger scale the conditions in which the carcass was mostly consumed by a fire fed by its own fat (being suspended on seat springs over a lot of char and ash below, which absorbed the dripping fat and acted like a wick) was not only possible, but actually what had been done at Treblinka. The seat springs would be the grates made of railway rails on which the bodies were placed, the wick the char and ash from the fire used to ignite the bodies. The fire would have to be strong enough for the bodies’ skin to char and split, which was certainly the case according to eyewitness descriptions whereby the wood sprayed with liquid fuel underneath the bodies (who were also sprayed with liquid fuel themselves, at least when they were "fresh" bodies) burned with a very strong and hot flame. 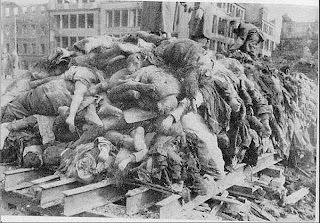 In this manner it would have been possible to cremate the bodies of the people murdered in the gas chambers with comparatively little external fuel (i.e. a weight ratio between wood and wood equivalent on the one hand and corpse mass on the other that was equal to or lower than in Lothes & Profé’s experiments), even though the results of cremation were not complete; witnesses mentioned that larger bones were left lying upon the grate after the fire went out and some parts of the bodies "preserved their natural shape", requiring much subsequent crushing work and sometimes (Yitzhak Arad, Belzec, Sobibor, Treblinka. The Operation Reinhard Death Camps, pp. 173 f.) having to be "returned to the roaster and re-ignited with a new pile of bodies". 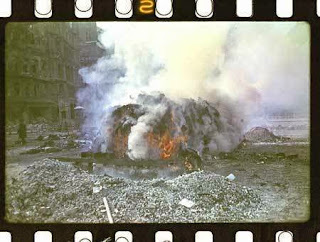 The color photo on top shows a pyre while burning, and in the foreground what are obviously the results of a previous pyre, i.e. small bone fragments that might be called "ash" and are thus referred to in reports about the results of the cremation (see this post on one of the aforementioned RODOH threads). German authorities didn’t consider it a waste to spend 68,000 liters of gasoline within 13 days to burn the bodies of civilian air raid victims at Dresden in February/March 1945, at a time when the Reich had lost almost all of its petrol resources and its war machine was bogging down for lack of fuel. Why should they have minded allotting higher amounts of gasoline to a state project of vital importance like the extermination of a minority of perceived dangerous subversives and useless eaters harmful to Germany, and that moreover at a time when the Third Reich still had access to its main sources of petrol, especially the Romanian oilfields? The daily petrol requirements of a single armored regiment were higher than those of corpse cremation at Sobibór if carried out with petrol as the main combustion agent, and even the daily requirements of Treblinka shown in Table 3.23 would have been below those of the 21st Panzer Division. Mattogno complained on page 1410 of MGK’s magnum opus (after having speculated on p. 1366, against evidence whereby the corpses were reduced to remains small enough to be called "ash" in a contemporary document, that "the purpose of the pyres in this case was not incineration, but the partial carbonization of the bodies for hygienic reasons") that I "neither state how much gasoline was needed nor to what degree the corpses were in fact cremated rather than just superficially charred". The first is false as I clearly stated that according to my calculations 68,000 liters had been spent within 13 days (and provided a link to a blog in which I showed how I had arrived at this amount). The second is equally false, as I quoted a secondary source (Charles Taylor’s book about the Dresden bombing, later substantiated by the primary source quoted here), whereby the bodies were reduced to what was called "ash" in a contemporary document, and not just "superficially charred". Maybe Mattogno is just a very inattentive reader, but it is also possible that he wanted to avoid providing his own estimate about the amount of gasoline used to cremate the corpses on the Dresden Altmarkt, perhaps also because his co-writer Jürgen Graf had complicated matters by furiously rambling (footnote 2420 on p. 1069) against my co-author Jason Myers' "outrageous assertion that only 25,000 people died in the fire-bombing of Dresden" (never mind that the "outrageous assertion" is supported by the report, prepared after several years of work, of a commission of 13 prominent German historians who examined all available evidence, as mentioned in this article, among others), and in all seriousness citing a report of the Ordnungspolizei Dresden which is supposed to have stated that "Until the evening of 20 March 202,040 dead bodies, predominantly women and children, were recovered. The number of victims is expected to rise to 250,000." (never mind that, as demonstrated more than a decade ago, the version of Tagesbefehl 47 cited by Graf was a crude forgery, in which a zero had been added at the end of each number in the authentic TB 47, making 20,204 recovered dead into 202,040, 25,000 expected dead into 250,000, and 6,865 corpses cremated on the Altmarkt into 68,650). Comically, Mattogno quotes my figure of 68,000 liters of gasoline spent on the Dresden Altmarkt (which one might think he considers too high, as he points out that wood and straw poked under the steel girders, "together with the clothing, reduced the demand for gasoline, which therefore could not have been 68,000 liters") a few pages (p. 1415) after claiming that I had not stated how much gasoline was needed. Maybe good old Charlie is becoming senile. Fortunately for "Revisionism", there is my friend Friedrich Jansson, who I’m sure will be glad to address the issue that Mattogno apparently preferred to dodge. PS, 14.04.2015: The archival reference given by Dresden historian Matthias Neutzner for the document mentioning how the ash resulting from the Altmarkt cremations was to be disposed of so as to salvage the boxes or sacks carrying the ash for reuse, in the excerpt from Martha Heinrich Acht - Dresden 1944/45 quoted in this RODOH post, is the following: StAD, Marstall- und Bestattungsamt, Nachtrag I - Schreiben, 4.3.1945 (Martha Heinrich Acht, p. 221). "StAD" stands for Stadtarchiv Dresden, the Dresden City Archives. The document previously quoted by Neutzner, whereby the burning of corpses on the Altmarkt was ordered "in consideration of the quickly progressing decomposition and the existing extraordinary difficulties in retrieving [the corpses] as well as the lack of suitable vehicles for transportation to cemeteries", is the Schlußmeldung über die vier Luftangriffe auf den LS-Ort Dresden am 13., 14. und 15. Februar 1945 (link was kindly provided by Mr. Jansson). This document mentions that the ash of the corpses was taken to a cemetery ("Die Asche der Gefallenen wurde auf einen Friedhof überführt."). One of the reasons given for deciding to burn the corpses (lack of suitable vehicles for transporting corpses to the cemeteries) is further evidence that Mattogno's speculation about the corpses having been "just superficially charred" is utter nonsense. For if there was a lack of suitable vehicles for transporting corpses to the cemeteries, what could possibly have been gained by a cremation that "just superficially charred" the corpses?